You created a thoughtful and creative website for your business and with the effective sales page you were able to convince the visitor to turn into a customer. Bravo! but what’s next? A contact form is one of the most essential elements of a business oriented website. Be it taking queries, collecting leads or accepting orders, the easier you are accessible, the better you monetize. A contact form with less frills comes handy here. Like everything else, there are a ton of plugins to add a contact form on a WordPress powered website, but only some them work out of the box. Here, we take a look at 5 best free Contact form plugins for WordPress. Contact Form 7 is another much popular WordPress Contact form plugin. While it supports almost all the features of Fast Secure Contact Form, it also supports Ajax powered submission in order to improve user experience. The plugin has a large user base and the plugin developer is active as well. Keeps it updating frequently. If you intend to use forms heavily on your website, this is the plugin to go. Cforms II not only lets you use multiple forms on a single website, it also lets you split a single form in to multiple pages which is helpful when you need to collect too much information from users. In addition it also helps you to maintain database based tracking of submitted data which makes it a great plugin for conducting surveys. You always don’t need a feature packed plugin as sometimes simple does better. In cases like your client is a newbie, ease of use does matter. 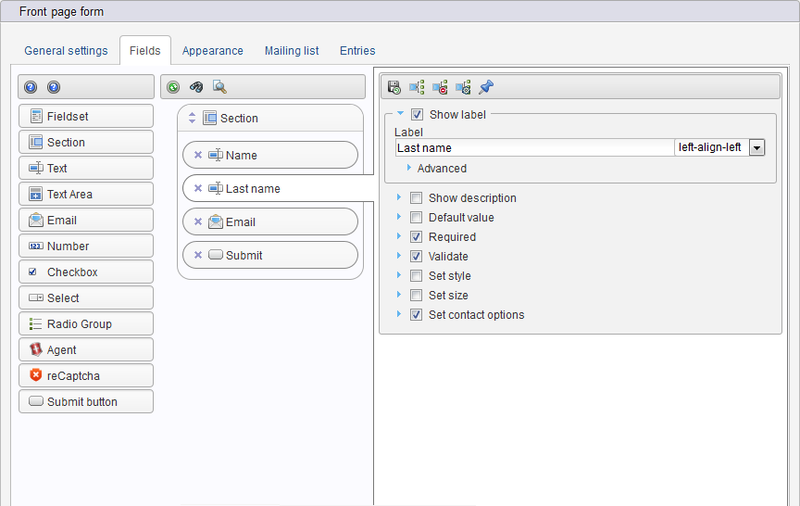 Easy contact forms plugin comes handy in such cases. Easy Contact Forms packs all the essential features yet keeps the UI simple. The forms aren’t just developers friendly, but visitors friendly as well. Here are the main features of the plugin. If all you need is a simple contact form and not an extensive form with too many forms, go with this. Adding forms with Slick contact forms plugin is as easy as adding a widget. Install and activate the plugin, drag the widget and you are done. 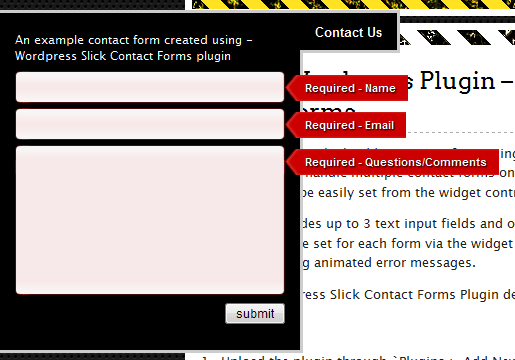 Slick contact forms plugin helps you create floating, drop down, sticky or a sliding form in a fly. These plugins are free, yet a great alternative to their paid counterparts (e.g. Gravity). With a bit of learning curve you can easily start publishing great forms. Did we miss some good plugin? Do you know some better ones? Let us know your thoughts via comments. All good but this one should be in your list next time. In my opinion, the best all-in-one contact form solution is at WP Plugin Pros. Their newly launched Page Designer Pro is the only contact form plugin I’m using now (after Contact Form 7) and would like to recommend it. I am not paid to say so I just really love its simplicity and great features. If you want to check it out guys it’s right here http://wppagedesignerpro.com/. Ashwini – would love to be in your next review. Let us know and we can touch base. Thanks for providing the great information. Always used contact form 7 but it’s all of a sudden become a bit of a pain to use, so have recently started using WPForms and I have to say is pretty dam good!